Critical Distance is doing a series for game bloggers called "The Blogs of the Round Table" (BoRT) where many people discuss the same topic (here's the post with some of the other posts). For their first one, the topic is how video games allow us to experience things virtually that we wouldn't normally experience physically. Yes, most gamers get to jump around and do backflips and kill hundreds, which they might not normally do in real life, but I'm more interested in two other ways video games introduce us to unfamiliar experiences: 1) the experience of being a different kind of person and 2) a transferable experience that enhances one's experience with the physical world. This post explores the first and I'll discuss the second next week. For the first, I think my small experience playing Assassin's Creed is relevant. Short background: I'm female and I've never really beat up anyone before. 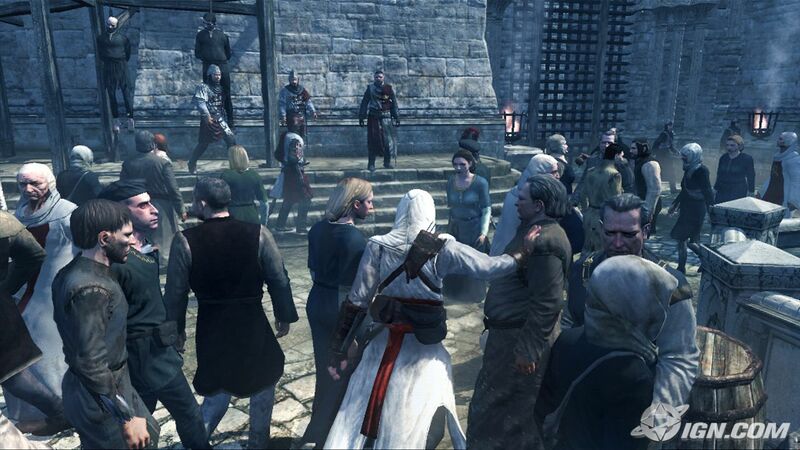 In Assassin's Creed, beating up other guys was par for the course, but the moment I accidentally hit a woman who was also a bystander I felt a pang of real-life guilt. I think she cowered and said "I have done you no harm!" or one of the other set phrases, but in that moment I felt like I had abused the power the game had so readily given me. I thought about the incident for days afterwards, wondering how I could have confused "push" with "punch". I felt that I had done something wrong. Maybe with this experience I understood a little the desire to protect women, who while taking care of their families or getting water or whatever the women in this game do with the pots on their heads are often ill-equipped for battle. I think it also helped me see how some men see women as fundamentally weaker and easy to overpower, and maybe how that overpowering could be a power trip? 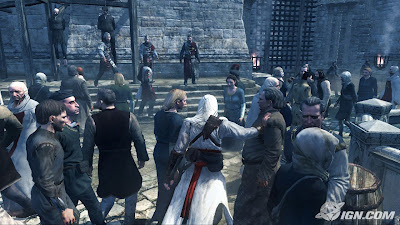 It's hard to describe what it feels like to be a powerful man, but I think playing Assassin's Creed helped me see why it's a fantasy for some people. Punching a woman in this game also helped me to understand how much the context of a violent act means to the perpetrator. If I'm killing a guy in the game who is making others' lives miserable, it feels justified (and I haven't finished the game yet, but I understand that knowing the whole story is going to be a big part of moral quandaries that make this game interesting). And if I randomly punch some bystander, that's not justified. Admittedly, the game's setup allows a lot of random violence, but my conscience does not.